Muthukumar Sandrakanthi with Thivahar and his family in their property in Kilinochchi. Muthukumar Sandrakanthi was only 36-years old when a charging elephant took her husband’s life. 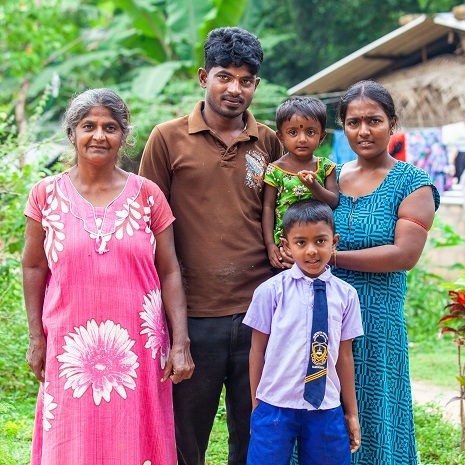 He had tried to settle his family in Kilinochchi in Sri Lanka’s Northern Province, but with a conflict underway, Sandrakanthi had no time to grieve – she had four children to raise and protect. Thivahar, her youngest son, was only four-years old. The end of the conflict would be bittersweet for this family. Thivahar, then 16-years old, was caught in the shelling in the final battle. He broke his right leg while a part of his left hand, including his thumb and index finger were sheared off. The family had been displaced for years by then, so they were sent to a camp for IDPs. But it was here that Thivahar met Sujatha. She says it was love at first sight. She was there by his side as Thivahar went through an agonizing year of physiotherapy in hospital and was by his side when he emerged on two crutches. They got married in 2011. Coming home presented its own challenges. “There was nothing left standing on our land,” remembers Sandrakanthi. They used tin sheets to construct a temporary home, but the lack of a toilet made it particularly hard for Thivahar. As he struggled to adjust to his disabilities, finding employment proved even more difficult. For a while he was employed as a helper in a vehicle service station but found the chemicals aggravated his wounds. He then tried to set up shop as a sound man, supplying speakers, mikes and mixing systems for local events in the temple, but managing the heavy equipment by himself was too difficult. The family by the side of Thivahar’s food cart. Thivahar’s latest venture is a food cart. He and Sujatha prepare snacks with Sandrakanthi’s help. They are delicious – Thivahar often sells out. His profits amount to about Rs.800 every day. However, this is only true of clear skies and busy working days. Sometimes, a holiday or inclement weather means no customers. On those days, the family throws away all the food they worked so hard to prepare just hours ago. 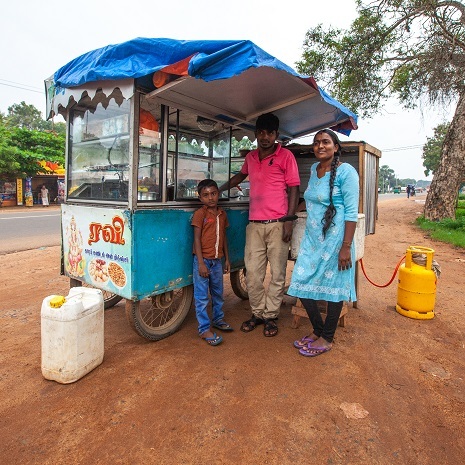 Thivahar’s expenses are also high – he pays Rs.10,000 a month in rent on the food cart, and an additional Rs.200 for a small stall. He also bought a three-wheeler and the loan repayments come to Rs.12,000 a month. It all adds up. Which is why neither Sandrakanthi nor Thivahar have been able to save the Rs.56,000 they needed to hire a surveyor to map out their land – a requirement before they could get their legal land tenure document. Fortunately, they were selected as beneficiaries under the European Union (EU) funded Catalytic Support to Peacebuilding Programme in Sri Lanka. This €8.1 million programme funded by the European Union is being implemented by the United Nations Children’s Fund (UNICEF), United Nations Development Programme (UNDP), and the United Nations Human Settlements Programme (UN-Habitat) in partnership with a range of state and non-state partners. UN-Habitat is implementing this project through the Ministry of Lands and Parliamentary Reforms, to ensure the identified land plots are professionally surveyed – Sandrakanthi’s land will be among 10,000 allotments surveyed by the Survey Department for issuing legal land tenure documents by Land Commissioner’s Department with EU support by the project’s end. Land registration processes can be challenging for his department because 30 years of conflict in this region means that many of the relevant records are simply missing. In addition, many land deals had been struck without adhering to current guidelines, and this has further complicated situations in which current owners want to sell or divide their lands. In other cases, ownership itself is in dispute with multiple parties coming forward to claim the same plot. With support from UN-Habitat, Muhunthan and his team have been holding ‘land kachcheris’ – a type of “clinic” for people having land problems. Over 200 (of which 50 were supported by EU-CSPB) have been organised in this district, which allowed people to bring their questions and concerns to officers who could then help them resolve the disputes. The Land Commissioner General’s Department has processed 5,930 land tenure documents – more than half way to the project’s final target of 10,000. So far, 13,978 beneficiary households (of a target population of 20,000) have gained improved access to land tenure under the project.